“[An] engrossing story...endearing and memorable.”—Boston Herald“[An] arresting hybrid of mystery, fairy tale, and historical novel.”—Detroit Free Press“A tale so movingly told that you will say at the end of the first reading, ‘It’s been a long time since I’ve read a book this good.’” —Nashville Tennessean Gregory Maguire proves himself to be “one of contemporary fiction’s most assured myth-makers” (Kirkus Reviews) with Confessions of an Ugly Stepsister, his ingenious and provocative retelling of the timeless Cinderella fairy tale. Perhaps best known for his dark and breathtaking Oz series The Wicked Years—including the novel Wicked, which inspired the Tony Award-winning Broadway musical—Maguire is a master at upending the ordinary to help us see the familiar in a brilliant new light. Book Description "[An] engrossing story...endearing and memorable." -Boston Herald "[An] arresting hybrid of mystery, fairy tale, and historical novel." -Detroit Free Press "A tale so movingly told that you will say at the end of the first reading, 'It's been a long time since I've read a book this good.'" <?xml:namespace prefix = o ns = "urn:schemas-microsoft-com:office:office" /> -Nashville Tennessean Gregory Maguire proves himself to be "one of contemporary fiction's most assured myth-makers" (Kirkus Reviews) with Confessions of an Ugly Stepsister, his ingenious and provocative retelling of the timeless Cinderella fairy tale. Perhaps best known for his dark and breathtaking Oz series The Wicked Years-including the novel Wicked, which inspired the Tony Award-winning Broadway musical-Maguire is a master at upending the ordinary to help us see the familiar in a brilliant new light. Editorial Reviews Amazon.com Review Gregory Maguire's chilling, wonderful retelling of Cinderella is a study in contrasts. Love and hate, beauty and ugliness, cruelty and charity--each idea is stripped of its ethical trappings, smashed up against its opposite number, and laid bare for our examination. 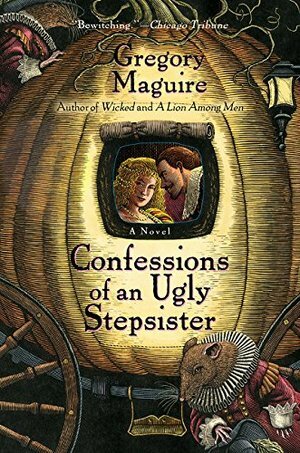 Confessions of an Ugly Stepsister begins in 17th-century Holland, where the two Fisher sisters and their mother have fled to escape a hostile England. Maguire's characters are at once more human and more fanciful than their fairy-tale originals. Plain but smart Iris and her sister, Ruth, a hulking simpleton, are dazed and terrified as their mother, Margarethe, urges them into the strange Dutch streets. Within days, purposeful Margarethe has secured the family a place in the home of an aspiring painter, where for a short time, they find happiness. But this is Cinderella, after all, and tragedy is inevitable. When a wealthy tulip speculator commissions the painter to capture his blindingly lovely daughter, Clara, on canvas, Margarethe jumps at the chance to better their lot. "Give me room to cast my eel spear, and let follow what may," she crows, and the Fisher family abandons the artist for the upper-crust Van den Meers. When Van den Meer's wife dies during childbirth, the stage is set for Margarethe to take over the household and for Clara to adopt the role of "Cinderling" in order to survive. What follows is a changeling adventure, and of course a ball, a handsome prince, a lost slipper, and what might even be a fairy godmother. In a single magic night, the exquisite and the ugly swirl around in a heated mix: Everything about this moment hovers, trembles, all their sweet, unreasonable hopes on view before anything has had the chance to go wrong. A stepsister spins on black and white tiles, in glass slippers and a gold gown, and two stepsisters watch with unrelieved admiration. The light pours in, strengthening in its golden hue as the sun sinks and the evening approaches. Clara is as otherworldly as the Donkeywoman, the Girl-Boy. Extreme beauty is an affliction... But beyond these familiar elements, Maguire's second novel becomes something else altogether--a morality play, a psychological study, a feminist manifesto, or perhaps a plain explanation of what it is to be human. Villains turn out to be heroes, and heroes disappoint. The story's narrator wryly observes, "In the lives of children, pumpkins can turn into coaches, mice and rats into human beings. When we grow up, we learn that it's far more common for human beings to turn into rats." --Therese Littleton --This text refers to an out of print or unavailable edition of this title. From Publishers Weekly The inspired concept of Maguire's praised debut, Wicked: The Life and Times of the Wicked Witch of the West, was not a fluke. Here he presents an equally beguiling reconstruction of the Cinderella story, set in the 17th century, in which the protagonist is not the beautiful princess-to-be but her plain stepsister. Iris Fisher is an intelligent young woman struggling with poverty and plain looks. She, her mother, Margarethe, and her retarded sister, Ruth, flee their English country village in the wake of her father's violent death, hoping to find welcome in Margarethe's native Holland. But the practical Dutch are fighting the plague and have no sympathy for the needy family. Finally, a portrait painter agrees to hire them as servants, specifying that Iris will be his model. Iris is heartbroken the first time she sees her likeness on canvas, but she begins to understand the function of art. She gains a wider vision of the world when a wealthy merchant named van den Meer becomes the artist's patron, and employs the Fishers to deal with his demanding wife and beautiful but difficult daughter, Clara. Margarethe eventually marries van den Meer, making Clara Iris's stepsister. As her family's hardships ease, Iris begins to long for things inappropriate for a homely girl of her station, like love and beautiful objects. She finds solace and identity as she begins to study painting. Maguire's sophisticated storytelling refreshingly reimagines age-old themes and folklore-familiar characters. Shrewd, pushy, desperate Margarethe is one of his best creations, while his prose is an inventive blend of historically accurate but zesty dialogue and lyrical passages about saving power of art. The narrative is both "magical," as in fairy tales, and anchored in the reality of the 17th century, an astute balance of the ideal and sordid sides of human nature in a vision that fantasy lovers will find hard to resist. (Oct.) Copyright 1999 Reed Business Information, Inc. --This text refers to an out of print or unavailable edition of this title. Picked this up solely based on the title, thinking it would be satirical turning the fairy tale on its head kind of story; I was expecting something more like the Broadway show Into the Woods. Turned out to be serious imagining of a source of the myth. And even though I was wanting funny, and was quite put off by the Mother character, for some reason I kept reading, albeit in short bursts across several weeks, usually just a few pages before bed.